Located in Parkersburg, Wood County, W.Va. Situated behind the Parkersburg branch of the Williamstown National Bank, 3002 7th Street, Parkersburg, W.Va.
With its first known internment, that of Philip Dils in 1801, the Dils Graveyard ranks as one of Parkersburg, West Virginia’s earliest community burying grounds. As with most early graveyards it began as a family burying ground; in this instance, of the Philip Dils family, the largest landholder in that section. As the Dils family grew and the area became more populated, the cemetery developed into a small community graveyard. Even though the land was well outside of city limits (Parkersburg was then the newly established town of Newport, western Virginia), it was situated along a busy thoroughfare, later to become part of the great Northwestern Virginia Turnpike. The cemetery is near Worthington Creek, a tributary of the Little Kanawha River. 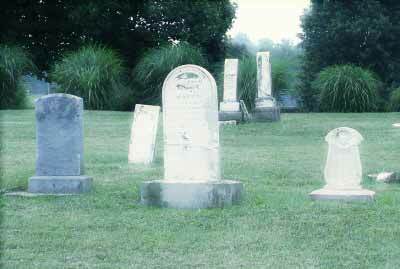 Historian John Albert House [1854-1938] describes the graveyard as follows: "The Old Dils Graveyard lies over two miles from the uttermost limit of the Parkersburg of one hundred years ago, yet it is now inside its eastern suburb. The southwest corner has the oldest graves, dating back to the [eighteen] Twenties and Thirties (and earlier). The surface of the ground is smooth, sloping gently from east of the middle to the western line. The southern half is cleft by the two steep hollows, at the junction of these hollows is a spring." A deed describes the cemetery as "being one acre, more or less". In 1857 the Roman Catholic Church also established a graveyard in the area. It abutted the Dils Cemetery property on the east side. In 1870 the Dils Graveyard, then owned by Philip Dils descendant James McNeil Stephenson, was deeded over to trustees, namely David H. Dils, William M. Evans, Andrew Murdy, and R.B. Stephenson. James McNeil Stephenson, however, did retain the rights to a small portion of the cemetery (adjoining the Catholic Cemetery) as a plot for his own family. This large family plot was sometimes referred to as the Stephenson Cemetery [not to be confused with the Stephenson Cemetery that is located behind the old Corning Glass Works]. James McNeil Stephenson, his wife, and possibly three infant children were buried there but were later disinterred and relocated to Mt. Olivet Cemetery. Until perhaps ten years ago, the oldest original headstone remaining at Dils was a monument to Captain James Foley, an American Revolutionary War soldier. It was replaced by one of his descendants with a durable marble veteran's marker. 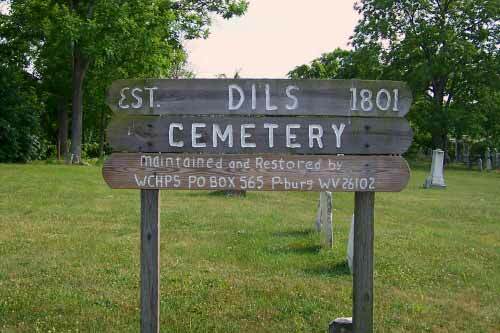 Dils Graveyard is the final resting place of many soldiers who served in the United States Civil War. Years ago, every Decoration Day (Memorial Day) soldiers' graves were tended to and adorned with fresh flowers by members of the G.A.R. and other fraternal groups. Only a small portion of the original headstones remain intact ~ some have been destroyed or removed by vandals, some fell over decades ago are now concealed by layers of sod, while most of the earliest sandstone markers have merely weathered away. 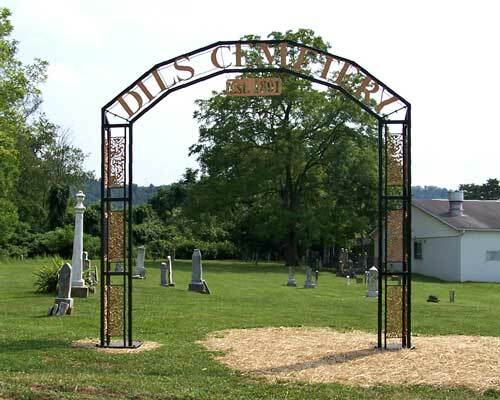 Since neither the City of Parkersburg, the County of Wood, nor the State of West Virginia have laws set in place for the perpetual care of defunct cemeteries, the maintenance of the Dils Graveyard has, over the course of time, been sporadic. City workers, Governor's Summer Youth Program participants, and others have, from time to time, tried to get a foot-hold on the upkeep; however, the elements and vandals always take their toll. 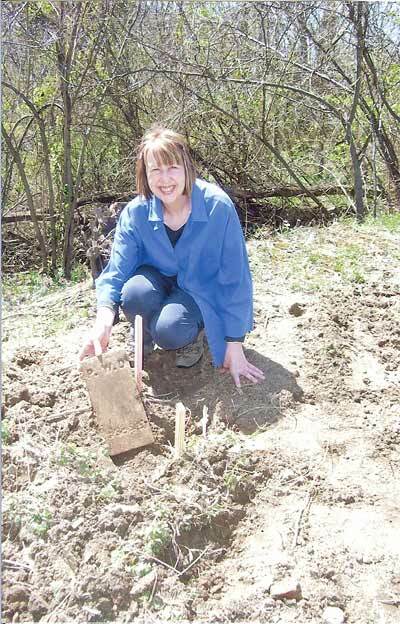 In August 2002 the Wood County Historical and Preservation Society (www.wchps.com), through the urging of Karlyn E. "Karlie" Lowers (direct descendant of Civil War soldier Samuel L. McHenry), began the monumental job of restoring the then-neglected cemetery. Brush was cut, litter picked up, grass mowed, and over time, fallen headstones set back into place. The Society is currently raising money to establish a perpetual maintenance fund. In 2010 a decorative entrance arch was installed from funds obtained from the Oakland Foundation. A dedication ceremony for the arch was held May 22, 2011. Although there is no known sexton's register listing all burials, readings of the graveyard's headstones have been recorded several times, such as John House's 1913 notations, the Historic Records Survey funded and conducted by the Works Progress Administration in 1931, and readings conducted by the Old Bible and Cemetery Records Committee of the West Augusta Genealogical Society in 1964. Below is a "new" list of burials, compiled from the above headstone readings, newspaper obituaries, family records, etc. Each entry contains the following information (if available): decedent's name, date of birth, date of death, parents' names, spouse's name, military service, headstone notation, source notation, and obituary information. The "headstone" or "footstone" notation indicates the presence of a gravestone for that individual as of 2011. The source notations (the numbers following each entry) correspond to the sources used. A complete list of the sources appears at the end of this list. All remaining gravestones have been photographed and can be viewed here. Names that are underlined are linked to a photo. To see the photo, just click on the name. Creel, Robert K. - cb:Dec. 8, 1854, d:Feb. 11, 1856, 1y 2m 3d, son of Hugh P. and Delilah E. (Foley) Creel headstone 1 2 3 Robert K. has his own headstone; his name is also inscribed on a larger marker on opposite side of brother James B. 's name. Eisele, Joseph (aka John Schafer) - b:Oct. 25, 1833, d:March 6, 1868, husband of Hildegard Armbruster. Found guilty of murder in Wood County, W.Va., and was executed by public hanging. Fornash, M. C. - b:April 13, 1848, 2nd wife of Charles Fornash headstone 1 2 3 Inscriptions for Charles, Debby, and M.C. Fornash are on one marker. Robinson, Mary E. - b:March 7, 1867, d:Sept. 13, 1886, dau. of Dudley and Prudence Robinson headstone 2 Inscriptions for Dora M., Dudley, Learmont L., and Mary E. Robinson are on one marker. Willis, William R. - b:Aug. 11, 1851, d:May 30, 1883, son of Jeremiah Willis? headstone 2 3 Willis family stone (with 2 carved books on top) includes inscriptions for Jeremiah, Margaret A., George S., Maggie, Henry L., John T., and Martha M. Willis family stone (with arches on top) includes inscriptions for Linnie P. and William R. William J.M.C. Willis has a small separate stone. 1. Some Early City, Village, and County Burying Grounds, by John A. House, "Dils Graveyard"
6. Genealogical information submitted by Richard Dils on Internet site "Ancestory.com"
9. Information from Edward "Ed" McHenry, Parkersburg, W.Va.